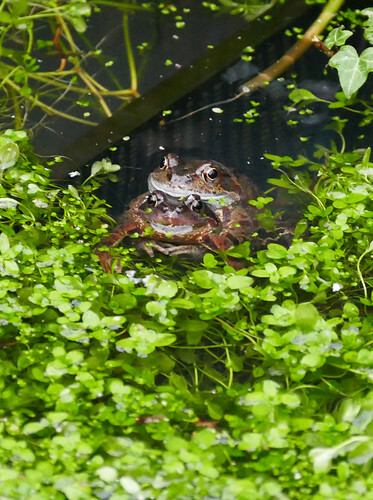 Saw these two in the pond this morning... isn't this a little early? I couldn't see any others; for now they've got the entire pond to themselves. The duckweed is already taking off, I noticed. Not really. Sometimes they start breeding in late December in parts of Cornwall. I did see a photo of spawn somewhere in the south about a week ago. Haven't seen any yet in my pond. My first vary from late Feb to mid- March. Certainly mild enough. Suspect first wet night will see arrivals. Lovely photo- hope they have lots of success. I only get a fraction of the frogs I used too + suspect the Smooth Newts greatly reduce recruitment of new frogs to the population.